When I drop Alex at doggy daycare, there is a check-in sheet where I add his name, my signature, and the drop-off time. I’m always amused by the variety of dog names on the list, Alex’s playmates for the day. There’s Bodhi and Kosmo, who must be wise old souls; Cricket and Frodo; Banjo and Echo; Axel, Cruiser, Diesel and Harley; Macgregor and Midnight; Sadie, Sasha, and Sunny; Sophie and Sweetpea; Roxy and Rosie; Nibbler, Brie and Gumbo; Chance and Cooper; Buddy, Chessie, Vixen and Zoe. There’s a story behind each name, I suspect.First, the story behind Alex’s name. I had reserved a puppy in his litter, not knowing if I would get a boy or a girl. Somehow I felt I would get a female pup, so I began making lists of girl names. They came easily, and soon I had a list of possibilities. I pored over books of dog names and web sites of dog names. I considered literary names such as Flush, Elizabeth Barrett Browning’s loyal spaniel. “Sounds like a toilet,” my mother said. As the big day approached, I winnowed the list to mostly human names for girls. Surprise! the litter was six boys. Within a few days the breeder had given each of them a puppy name, and she was diligent about emailing photos of the boys every few days. At 8 weeks she would evaluate each pup, taking into consideration its show potential, temperament, and fit with the owner’s lifestyle, before placing it. I had told her I was not interested in showing, but hoped to train my pup to be a therapy dog. “So you want a laid back but confident puppy,” she replied. Exactly. I was having trouble finding a boy name that suited. “Names that end in -er, like Spencer or Cooper, are good for boys,” a friend advised. 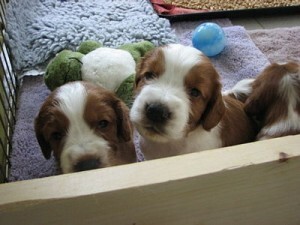 My previous Welsh springer, Byron, had also been a challenge to name. His original name was Ivan, and I wanted to change that lest he become known as “the Terrible.” I consulted guidebooks to Wales, but all the place names were unpronounceable. In the end, Byron was named for a small California winery that produces a wonderful Chardonnay. I had a bottle sitting on the kitchen counter as I mulled over names. It seemed to fit, and Byron it was. I knew the right name for my new pup would appear, but as the weeks went by I wasn’t getting anywhere with boy names. As the date to pick up the puppy approached, I mulled over names in earnest. The puppy I would get was called “Winters” as he had a small snowflake type of mark on his back. I studied the photos of his adorable puppy face for inspiration. I looked at his pedigree for ideas. Then, like a bolt from the blue, the name appeared. I have a wonderful CD by British composer John Rutter than includes All Things Bright and Beautiful. I played it for Byron and Emily often, and for me it captures the innocence, beauty, and spiritual essence of all animals. I’m pleased to connect Alex’s name with this timeless hymn. What’s the story behind your dog’s name? I’d love to hear it! This entry was posted on Sunday, May 31st, 2009 at 12:29 pm	and is filed under Adventures of Alex, the Welsh Springer, Uncategorized. You can follow any responses to this entry through the RSS 2.0 feed. Both comments and pings are currently closed.